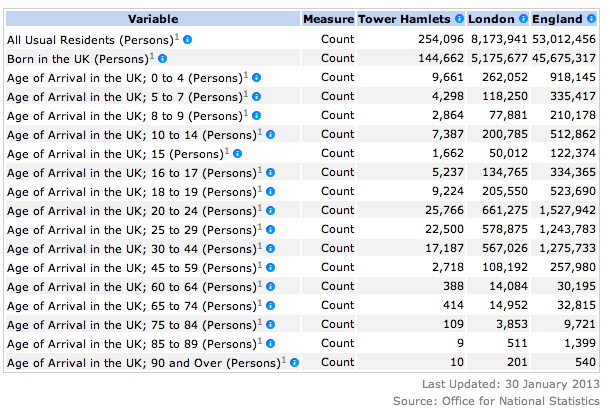 Let’s have a look at the borough of Tower Hamlets in numbers. 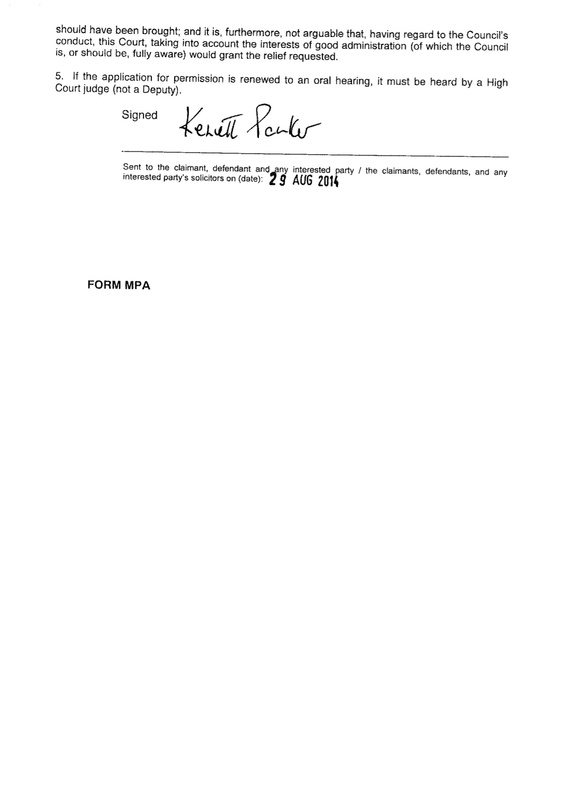 The statistic politicos always cite is this one: there are 46 elected representatives–one mayor and 45 councillors. Of those, 27 are Bengali (59 per cent), one is Somali (two per cent), while 18 (39 per cent) would describe themselves as white. All the following other figures are from the Office for National Statistics 2011 Census survey. As they say, there are lies, damned lies and statistics. But there are also myths that statistics help to bust. 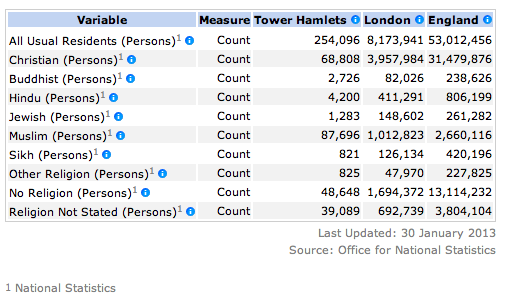 There are 254,096 residents in Tower Hamlets. More than half are men, which is a touch higher than the London or national average. Most live in households as opposed to hostels and other communal establishments, such as student halls of residence. 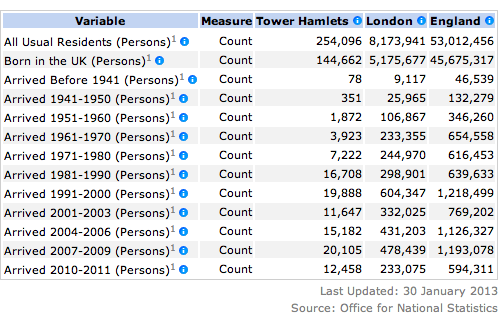 Look at the last row and we see what we already know–that Tower Hamlets is densely populated, with the number of people per hectare more than double the London average. There are 114,819 people who describe themselves as white, or 45 per cent of the population. White British people account for 31.2 per cent. White Other, such as French, Germans, Americans, Lithuanians, Australians etc, account for 12.4 per cent. British Bangladeshis account for 32 per cent. There are also 22,975 people who are of black African/Caribbean/mixed white Afro-Caribbean descent, or 9 per cent of residents. Three per cent of residents have a Chinese heritage, or 8,109 people. 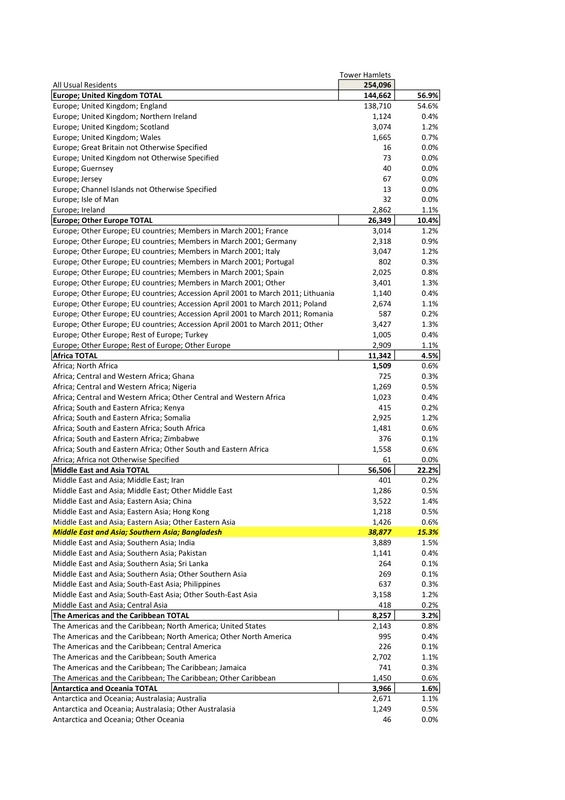 Remember, there is just one Somali councillor, but none from the category ‘Black Caribbean’. When was the last time we had a councillor who would describe themselves from this community? What is being done to engage in this area? Rarely, if at all (and perhaps after the 2011 riots), have I heard any discussion in council meetings about this category. Is this where the real racism exists? People who stated they were Muslim accounted for 34.5 per cent of residents (87,696). Clearly, almost two-thirds (65.5 per cent) are not Muslim. Those saying they were Christian were 27 per cent, while 19.1 per cent said they had no religion. Compare this with the London and England averages. In London as a whole, a relatively large 48 per cent stated they were Christian compared with 59 per cent across England. In London, 12.3 per cent (one in eight) are Muslims, compared with five per cent in England. Of the 144,662 people living in Tower Hamlets who were born in the UK, more than half started life in England, ie 54.6 per cent. Of those born abroad, 14,607 were born in ‘old EU’ countries such as France, Germany and spain (member countries in 2001). Another 7,828 have come from ‘new EU’ countries such as Lithuania, Latvia, Poland and Romania etc. But far more were born outside Europe, ie some 80,000 people. I wonder how many people would be surprised to learn fewer than half these are from Bangladesh, ie 38,877. The rest were born in at least 30 other countries, with India, China, Somalia, and the US leading the pack. Of those, we hear much about the Somali community in council meetings…probably because they’re far more of a settled community. But what about the Chinese community? Again, I can’t remember any discussions about them. Why is that? While 144,662 people were born in the UK, 176,531, or 69.5 per cent of the borough’s peopulation) holds a British passport. 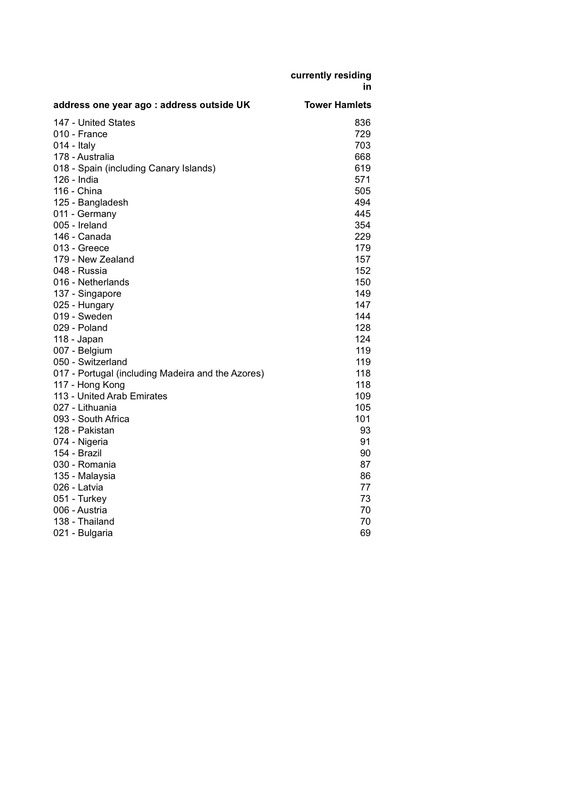 Table 2 showed us that 56,506 were born in ‘Middle East and Asia’, including 38,000 in Bangladesh. Of these, only 22,184 people hold passports for those countries. More than half of the borough’s population were born in the UK, ie 59.9 per cent, or 144,662 people. The averages for London and England are 63.3 per cent and 86.2 per cent respectively. Of the 109,434 people born abroad, 65,453, or 60 per cent, were aged between 20 and 44 when they came to the UK. Now have a look at this..
Of the 109,434 people in Tower Hamlets who were born abroad, more than half have come to the UK since 2001, ie 59,392, or 54 per cent. That’s 23.3 per cent of the entire borough population, ie almost a quarter. You could look at it this way: 36,596 people now living in Tower Hamlets arrived in this country during the two Thatcher and Major decades (from 1981-2000, say)…while 59,392 came during the Blair/Brown decade. I can’t find an ONS table to show from which countries these 59,000 migrants came, but here’s an indicator of the latest flows. 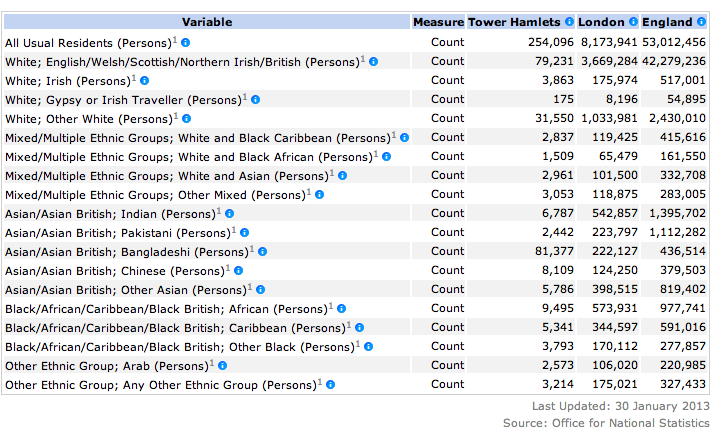 This table relates to the current 2011 population of Tower Hamlets. It shows the usual country of residence for people a year before. I’ve included the top 50. 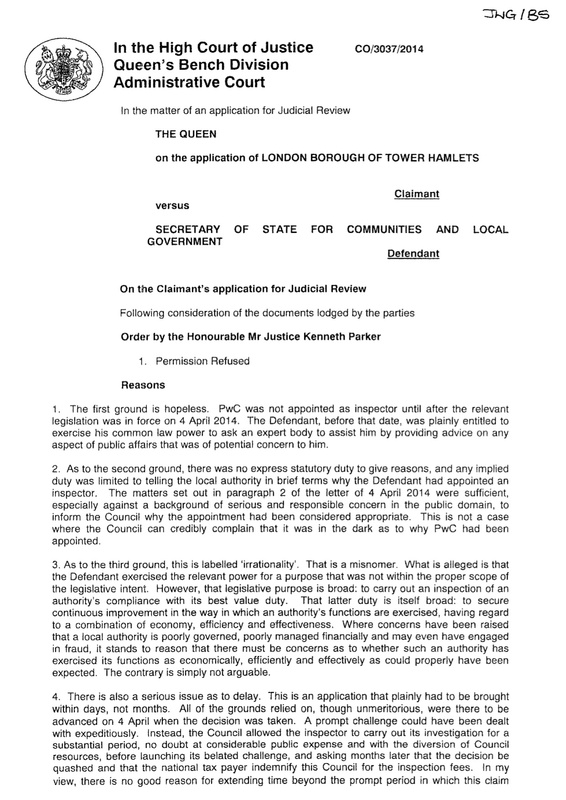 Those damned Yanks and French–they’re swamping Tower Hamlets. Blame the bankers probably. Meanwhile 494 people came from Bangladesh. Some of those could be short term students. And as for those central and eastern Europeans…fewer than 800 came from seven countries to the borough in 2010/11. Almost two-thirds of people in the borough stated that English was their main language, ie 159,488 people, or 65.8 per cent of those over the age of three. It follows that more than a third (34.2 per cent), or 82,880 people, do not use English as their first language. Of those, more than half do not apparently believe they speak English “very well”. 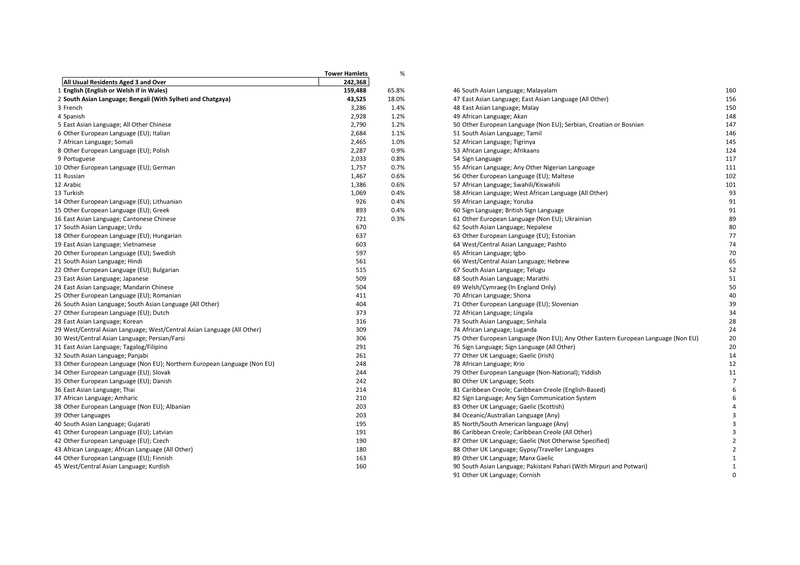 What are these other main languages spoken by almost 82,880 people? What proportion do you think is accounted for by Bengali/Sylheti? So 43,525 people speak Bengali/Sylheti as their main language. That’s 18 per cent of the borough’s population–fewer than one in five. But here’s an interesting thought. 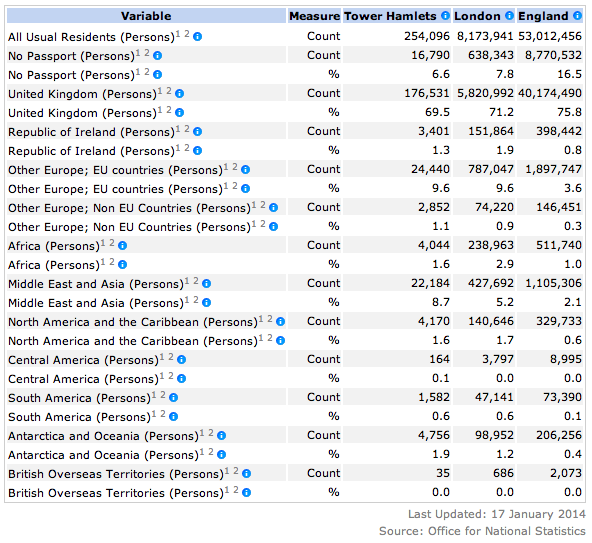 From figure 2 above, there are 81,377 people in the borough classifying themselves as Bengali. That means about half (53.4 per cent to be exact) speak Bengali as their main language. Presumably, the main language for the other half is English. This is the generational change. Younger Bengalis speak English first and foremost. The older guard worry about this. And some of them are senior figures in the council. They’re rapidly becoming irrelevant. And for the time being, here’s one last table that I found interesting..
Just 0.06 per cent of Tower Hamlets residents are employed in the Armed Forces. It’s not a Tower Hamlets ‘thing’ actually. The percentage for London as a whole is only 0.08 per cent. This compares with 0.2 per cent for England nationwide. London is the worst recruiter for Armed Forces personnel. Why is that?